An enduring principle at Kidrobot‘s initial foundation was to allow employees to blossom and express their own voices artistically, to design works for the company that would bear their own name and vision. Or, at least, this tradition wasn’t uncommon during the brand’s first decade, when the likes of Marketing Director The Baroness and former San Francisco location Store Manager Huck Gee had pieces issued under their own names. While this practice fell to the wayside after founder Paul Budnitz‘s departure from the company, it is one that current Chief Creative Officer Frank Kozik has returned to prominence, with in-house designers Johnny Draco, Sharon Park, and Josh Divine all given opportunities to express themselves on the brand’s Dunny form. And the most recent example of this is a perfect instance of Head of Concept Design’s Josh Divine’s personal artistic output, which has included to date Howlin’ Hank (learn more here), Astro Crash, and the forthcoming Captain Satan pieces, added to which is the new Wolf Cash limited edition creation. While the vicious aspects and voracious appetites created by a culture of capitalism have been explored in fictional works like Bret Easton Ellis‘ American Psycho and memoirs such as Jordan Belfort‘s The Wolf of Wall Street, the metaphoric well from which this concept runs never seems to be completely dry. For Divine’s roughly 5-inch tall Dunny design, Cash Wolf, this factory-painted production edition depicts a cartoonish wolf character, its exterior adorned with elements commonly associated with United States currency. And should this beast’s pointed tooth emerging from its sly smile fail to properly convey a tone of maleovence, its yellow-toned pupils are engulfed by downward-pointing pentagrams, reminiscent of the official symbol for the Church of Satan. But these overt interpretations aren’t the only ones that can be read into Divine’s Cash Wolf, particularly in considering the quote from William Carlos Williams‘ poem “The Great Figure” that is emblazzoned upon an inner flap of the piece’s packaging. With Williams’ words purportedly being a condemnation of an increasingly soulless society lost in its own supposed advancement, the potential correlation with Divine’s design becomes clearer — a decided blow against the cold culture that places capitalism above all else. And thus it seems strangely just that a work created for the consumers, using production techniques to maximize profitability, is also a commentary on the very marketplace it inhabits. While this wolf certainly doesn’t shroud itself in sheep’s clothing, Divine’s design isn’t restricted to the green coloration’s 800 piece limited edition. Additionally, Kidrobot have issued their own exclusive version, a blue-hued color scheme that’s limited to an edition of 200 pieces, one that’s tones recall the frigidness that must be in the heart of an endlessly greedy capitalist. 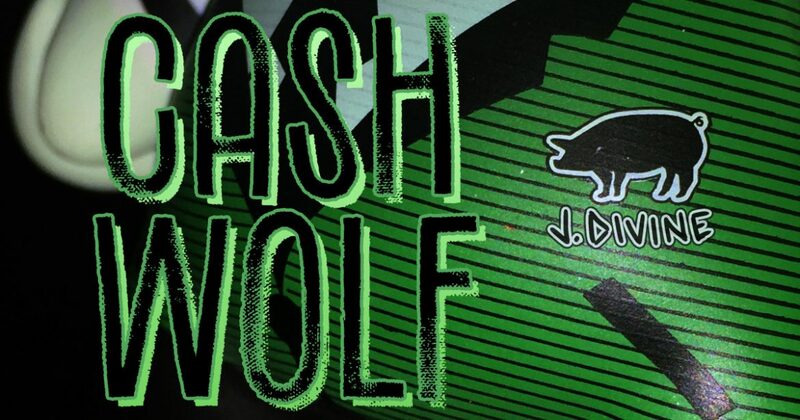 Click Here to Acquire Josh Divine’s Cash Wolf Dunny from Kidrobot, or Click Here to Find a Kidrobot Retailer to Order it from.